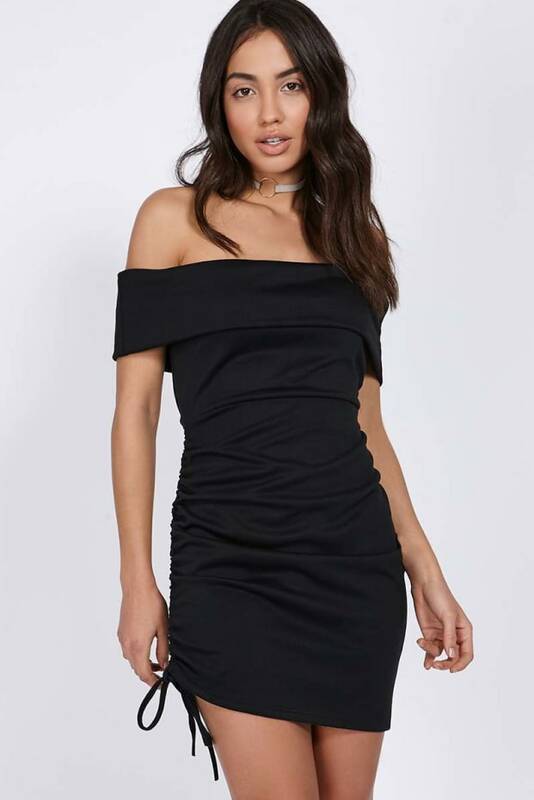 If you're looking for that perfect outfit then this bardot overlay mini dress is a MUST have! Featuring a cute ruched drawstring side, styled with a pair of sass heels this is the ultimate head turner! All orders that contain pre-order items will be shipped as a whole order once the pre-ordered items are ready to be dispatched. If you are not available to accept your delivery, the courier will attempt to leave your parcel with a neighbour. We aim to deliver all orders within specified delivery times. On occasion, for reasons beyond our control, this may be longer. In the event that an item you have ordered is out of stock and our website did not notify you prior to your order, we will contact you via. telephone or email ASAP to notify you. You are entitled to cancel the order at this stage, should the delayed delivery be of inconvenience. In the event that your order arrives damaged (i.e. visible damage to either the goods or packaging), we ask that you refuse delivery and request it to be sent back to us. We will inspect the damage and have a replacement sent to you ASAP. All deliveries will require a signature from a person at the customers’ given address. If a signature cannot be obtained by our chosen delivery company, a calling card will be left and the item(s) will be returned to the depot. From here, you will need to arrange a re-delivery with the depot. We reserve the right to cancel any order which is logistically too complicated to deliver. We will treat this order as a cancelled order, and a refund will be issued if any monies have been paid. Want to return your order? No problem! You can return your item(s) within 14 days for a full refund or exchange – excluding delivery charge. Should you return your item after this timeframe, you will only be eligible for customer credit. Where credits are issued, these will have no expiry date. We can only process UK and IE exchanges. All AUS and USA exchanges will be processed as a refund. We recommend you use a reordered service so your parcel can be easily tracked, as we cannot be held responsible for any lost parcels. All items must be returned with the tags still attached. Please take extra care with your purchases as, unfortunately, we cannot refund or exchange any items that are marked with make-up, fake tan or body lotions etc. Grooming products, pierced jewellery, perfume (where the cellophane packaging has been removed), underwear or swimwear (where the hygiene seal has been removed) cannot be returned for health and hygiene reasons. Shoes that show any signs of wear cannot be refunded. Please try on all shoes indoors. Refunds will be processed within 14 days of being received. Funds will be refunded to your original method of payment within 7 days, subject to bank clearing times. Please make sure you retain your proof of return, and keep this safe until you have been credited for your returned items. Note: Any items purchased with a 20% or more discount code, or any sale items, are considered final sale and will not be accepted for return unless faulty. The above are In The Style terms, but do not affect your statutory rights. If you have any issues with your order, please contact us at customerservice@inthestyle.com within 7 days of receiving your order.